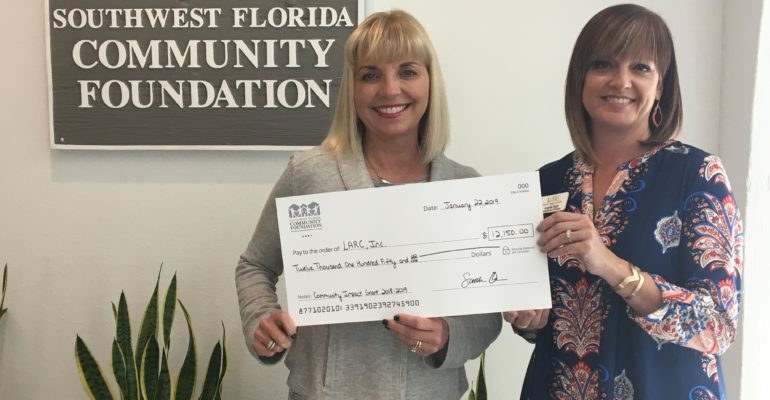 Lee Association for Remarkable Citizens (LARC) received a $12,150 Community Impact grant from The Southwest Florida Community Foundation to purchase iPads, cases and apps for individuals in LARC’s Bonita Springs Adult Training program. LARC’s Adult Day Training program is designed to enhance abilities and help individuals with intellectual and developmental disabilities live a happier, more productive and independent life. Activities include self-care and daily living skills, as well as a variety of pre-vocational and life skill opportunities. Opportunities are provided to increase fine and gross motor activities, communication skills, academic skills, positive behavioral approaches, independent living skills, social skills and recreation and leisure skills. To learn more about LARC and LAB, contact Angela Katz, Development Director at 239-334-6285 x229 or email angelakatz@larcleecounty.org or visit www.larcleecounty.org. Established in 1954, LARC Inc.’s mission is to empower and support individuals with disabilities and their families to reach their full potential. LARC is a 501(c)3 that provides programs and services for approximately 300 local men and women annually. The nonprofit offers vocational training, community residential services, and a vast array of other state-of-the-art community inclusion services on a full-time, year-round basis. LARC’s main campus is located at 2570 Hanson Street, Fort Myers, and has a satellite campus in Bonita Springs. LARC also operates two Residential Group Homes located in Cape Coral and North Fort Myers. For more information, contact Angela at 239-334-6285 x229 or visit www.larcleecounty.org.